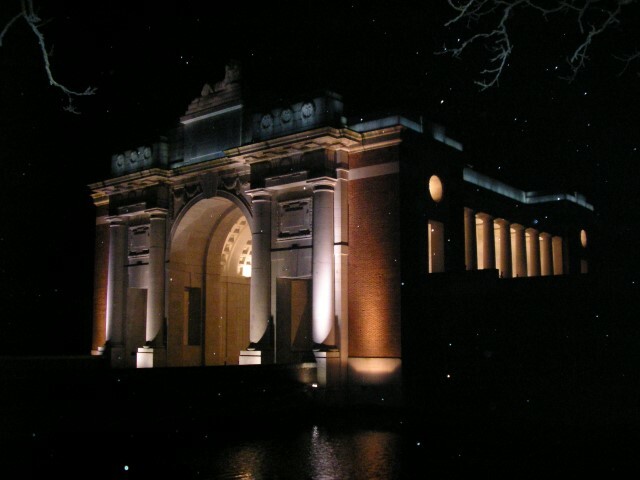 21806 Private William Scott, 20th Battalion, the Durham Light Infantry was killed in action 31 July 1917 and is commemorated on the Ypres (Menin Gate) Memorial. He was 27 years old, married and is commemorated on the West Auckland War Memorial and the Roll of Honour, West Auckland Memorial Hall. In 1891, the family lived at Gladstone Street, West Auckland where 22 year old William was employed as a coal miner. Jane died 1894 aged 26. In 1897 William married Martha and they had 1 child, Beatrice bc.1897 at West Auckland. In 1901 the family lived at Batey’s Yard, West Auckland and 33 year old William was a coal miner (hewer). In 1911 the family lived at 10 Johnson Terrace, West Auckland. William still worked as a coal miner (hewer) and 21 year old son William was a coal miner (putter). 12 April 1911 William married Elizabeth Collinson and they has 2 children Walter born 17 March 1914 and Joseph William born 19 August 1917. When William attested in July 1915, his address was given as 28 Church Row, Burnhope. Elizabeth was pregnant when William was killed. In August 1919 Elizabeth lived at 40 Albion Street, Witton Park. At a later date Elizabeth remarried. 1 February 1915 William Scott attested at Barnard Castle when 25 years old and was given the regimental number 21806. He was 5” 3’ tall and weighed 124 lbs. 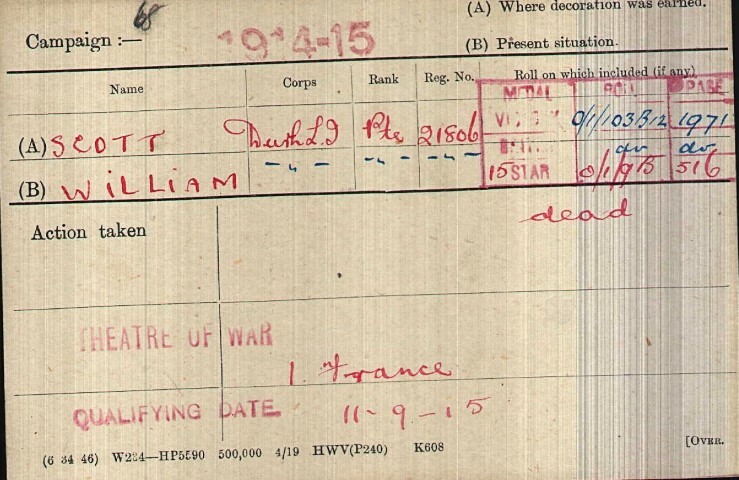 He was posted to the 17th Battalion then transferred to the 14th 6 September 1915. Private W. Scott entered France 11 September 1915. The 6th Division was involved in the trench warfare in the Ypres Salient. Private W. Scott spent some time, 2 weeks at Etaples with influenza and re-joined the battalion in the field 25 August 1916. 14/DLI saw action at the Battle of the Somme, the Battle of Flers-Courcelette, the Battle of Morval and the Battle of Le Transloy. 23 September 1916, Private W. Scott suffered a gun-shot wound to the back and spent 87 days in hospital, 23 September – 19 December 1916 in the UK. It is likely that his wound was inflicted during action at Flers-Courclette. Private W. Scott was with 20/DLI and saw action at the Battle of Messines 7 – 14 June 1917. 20/DLI spent the first 3 weeks of July at Mont des Cats when over 250 men were absorbed from drafts. Training for the attack which would signal the beginning of the Third Battle of Ypres, 20/DLI was based at Kenora Camp near Westoutre. 20/DLI was relieved on the night of 1 August. Later research records that between 31 July and 2 August, 20/DLI lost 6 Officers and 57 Other Ranks killed in action or died of wounds, 4 Officers and 55 Other Ranks on 31 July 1917. 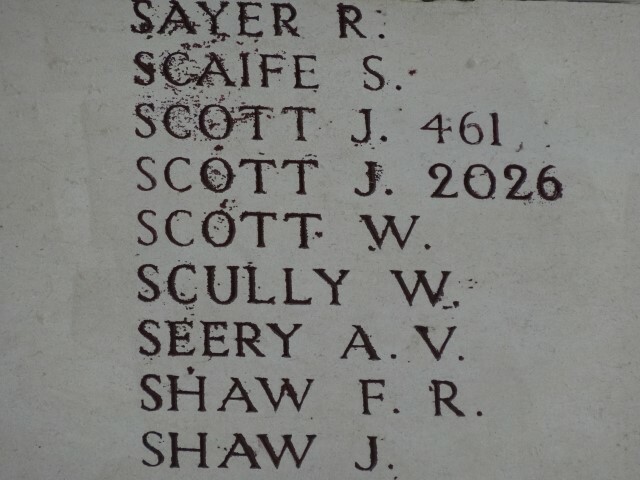 Private W. Scott is commemorated on the West Auckland War Memorial and the Roll of Honour, West Auckland Memorial Hall.